You are here: Home / Domestic Bliss / Best Homemade Bread Recipe EVER! It was so good that I’ve decided that I will never buy bread from the store again. I’ll have to let my mother-in-law know that I’m keeping her bread machine forever and all eternity if she doesn’t mind. 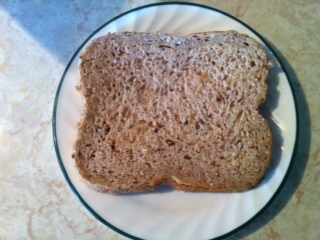 It’s a delicious, sweet multigrain bread that was just so awesome that I was reluctant to spoil it by using it to make a turkey sandwich. But I did, and it was even better. Add to bread machine bucket in that order, put bucket in machine, select multigrain and start. And then let it do its thing. It was incredible. Give it a try and let me know what you think!